Note: This program may not run well on a low-spec 'netbook' type computer, or older single-core Pentium, as the processing power required for reception is high. Check the Task Manager, and on a slow computer make sure no other unnecessary tasks are running. Sending text using FSQ is generally very reliable, certainly more so than other digital modes with no error correction. Therefore with just a little checking for errors, it has been possible to devise a very simple network management system (simple to use, that is), which runs on top of FSQ, and which can provide clutter-free communication (station selective squelch), network management, and several useful related tasks. While not attempting to be a full Automatic Link Establishment (ALE) system, FSQCALL (pronounced "F.S.Q. Call") performs enough similar functions to allow stations to establish links within a network, and manually pass or relay simple messages. The focus is on sending simple one-sentence directed chat, messages or commands in a manner suited to the FSQ mode. While you can use the FSQCALL protocol for chat, its main intention is to establish contact to facilitate communication via other modes or mediums. Send an Alert to another station. Find a station's location and status. Read a station's pre-defined message. 'Poll' a station to check how reception is. Read a stations recently heard stations list. Send a sentence to all stations within range. Send a sentence to just one specific station. Change the sending speed of another station. Send a text file that can be stored in a specific file. Type a sentence that can be stored in a specific file. Call CQ (prints at all stations in range where CQ is enabled). Determine which other stations have been active, and when. Determine which version of software another station is running. Have a station relay your sentence to another station or stations. Send a periodic 'sounding' burst to let other stations know you are active. Send an image file in one of several formats including a high resolution FAX mode. This all sounds like a tall order, but cunning design has allowed all this to be achieved with just ten easily remembered commands. The program itself lists the operating rules and syntax for you, so you can't go wrong. The FSQCALL message structure is simply an extension of FSQ. Every sentence starts automatically with your_call:crc. The crc (Cyclic Redundancy Check), two letters and/or numbers, is used to ensure that the source callsign is received correctly, since it's often used in automated replies. The changed preamble (header) also alerts other stations that you are in FSQCALL mode. You simply type a destination callsign (or maybe more than one), which we call a direction, a one-letter command for each callsign, which we call a trigger, and a message, if needed. Then you just press ENTER, as in normal FSQ. The callsign shown at the beginning of the displayed reply above is recovered locally from the incoming preamble and verified against the CRC, then printed ahead of the incoming message text, so it looks the same as in FSQ mode, but here the callsign has been verified. zl1bpu:b6zl2abc Have you seen Jim ZL3JIM lately? zl1bpu:Have you seen Jim ZL3JIM lately? zl2abc:2ezl1bpu Yes, he was at the club meeting on Wednesday. zl2abc:Yes, he was at the club meeting on Wednesday. As you will by now have gathered, if your callsign isn't in an incoming message, nothing will print. In the same way, unless you preface each transmission in FSQCALL mode with a direction (target callsign) or allcall (a generalized callsign for all stations), nobody will see what you've sent. FSQCALL acts like a smart squelch. It opens the receiver for printing (and other actions) when your callsign is received, and closes again when the actual receiver squelch closes (when the other station stops transmitting). The Squelch is also 'fade-proof', using a smart delay squelch design to ride through fades that might otherwise close the Selcall. Because the squelch also locks-out transmission, just as in FSQ, stations generally do not transmit over other stations, or reply until the other station has finished transmitting. Various randomized delays are also added before automatic replies, in order to manage the priority of messages on the channel and minimize clashes. This protocol is called Carrier Sense Multiple Access (CSMA). Manually typed messages have the highest priority, automatic responses have medium priority, and sounding messages the lowest. Detailed descriptions of the FSQCALL Syntax and FSQCALL Rules are also listed on the program Options Pane Syntax and Rules tabs. Using a full error correction system would add unacceptable delay and markedly reduce throughput, spoiling what is a remarkably slick design. Since FSQ is generally robust, an error correction system for FSQCALL is considered unnecessary. Unless the preamble is correct, the software won't know who to send automatic replies to! If the preamble is incorrect, the message may have errors, and you may be sure who it's from, in order to ask for a repeat. This callsign verification approach eliminates the risk of spurious callsigns appearing in Heard Lists and logs. Each message is also of course checked for the correct destination callsign (your callsign), and if that's not present, or received incorrectly, the message is ignored. It's also ignored if your callsign is not immediately followed by a permitted trigger character. These are the command characters used to tell the receiver what to do. Here are the main trigger characters: ? * ! ; # % + @ & $ < and >, plus space. (There are also a few rarely used ones that you don't need to remember). Quite simply, if you don't get an expected reply to your command or message, you just send it again. Messages that don't have an automatic reply (the only one is the 'chat' sentence, callsign followed by space) are best used only when the other station is attended, otherwise you've no way of knowing if it was received. If it wasn't received, and the station is attended, the other station operator will probably send "agn?". The program has a 'Monitor Pane' as one of the Options Panes, and you can always keep an eye on that to see if there was anything you might have missed. This is especially useful if for some reason the squelch closes early (typically caused by a fade), the station operator does not format the message correctly, or some station is calling you, but doesn't have your callsign the same as you've set it. This is a very brief summary. For full syntax, see the Syntax tab within the program. All you do is type a callsign (or several callsigns or just allcall), followed by a command character (or space) and then, if required, a message. It really is that simple. Commands can also be relayed. There are various ramifications involved if the syntax is used improperly. Check also the FSQCALL Rules. Several other trigger characters are reserved for additional features. The simplest application for FSQCALL is to provide a 'watering hole' for a group of friends who wish to keep in touch, pass messages and chat occasionally. Experience has shown that leaving your equipment running on 7105 kHz during the day, and 3580 kHz at night, will provide fairly reliable communications over about a 500 - 1000 km range. Depending on propagation, 40m may well work day and night. Only modest power is required. You can leave a message for your friend if they aren't available, and even use one friend to relay a message to another. The software will tell you who is currently available. If you wish to chat with two or more friends at once, simply include both/all their callsigns in each sentence. Alternatively, use allcall as the address, and everyone will receive the message. In order to avoid serious mayhem on the radio channel, the automated replies do not work with allcall. When chatting with FSQCALL on, your receive screen is completely free of clutter, noise-induced characters and traffic from other stations. Sounding transmissions are also invisible, but still register in the log. FSQCALL is also designed for management of field stations in an emergency, exercise, or sports event scenario. FSQCALL should not be used to pass important messages (and it won't handle large files), but is absolutely ideal for passing commands such as changing location, requesting specific information, or passing on changes to plans, schedules and contact information. Typical messages would be 'Call John (09) 554 321', 'Prepare to receive file in RFSM8000, this QRG', or 'Check number of stage starters with marshall'. By using FSQCALL, the field stations can remain in contact without having to listen on a radio channel (which can be very tiring), and without missing a message if they step away from the radio for some reason. FSQCALL also works really well on VHF FM, or on VHF repeaters. Stability of equipment can be an issue on VHF, especially with narrow-band digital modes. Using audio subcarriers on an FM transmission avoids this. In addition, if the transceiver can be operated with the FM squelch open (you often don't need to listen anyway), FSQCALL will easily copy signals that won't open the squelch. In fact it has been found that the sensitivity of IFK modes on FM is much better even than VHF SSB. Operator training requirements are minimal. Practicing with a couple of laptops chatting across the clubrooms (use audio cables rather than speaker to microphone) for an hour or so will train new operators well. Another hour spent with each operator's own HF equipment connected would be useful in order to check out and become familiar with their digital interface, connections and settings. Only the features that are different from general FSQ use will be described here. See FSQ Help for help with general FSQ operation. When FSQCALL is OFF (default state), normal FSQ operation occurs, and the program window is displayed in FSQ mode. There are two other FSQCALL states: SLEEP and ACTIVE. Switching between these is done using an on-screen button. When you select FSQCAL/FSQCALL ON from the Menu, FSQCALL changes to ACTIVE state, and many internal changes take place within the program. The visible differences are the appearance of the tabbed Option Panes, the Heard List and four extras lit buttons under the Option Panes. The size of the Transmit Pane and Waterfall are reduced to compensate. Monitor Displays all traffic on the channel. Useful to spot stations not in FSQCALL mode. At the right is a list of recently heard stations. RX File Displays the contents of the last text file received. Syntax Lists the syntax for each FSQCALL command. Move the slider to read through the list. Rules Shows the standard operating rules for FSQCALL, and also recommended operating frequencies. 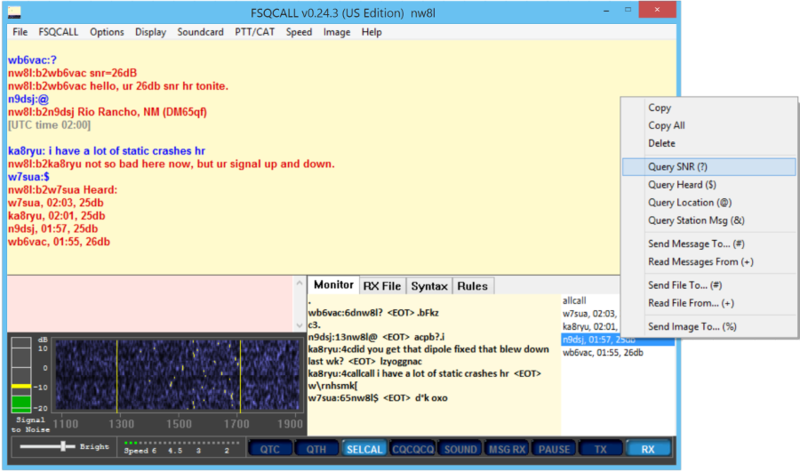 The Monitor will help you identify stations that are not in FSQCALL mode, and is useful for determining why FSQCALL directions fail, for example if the checksum is wrong, the operator's procedure is faulty, or the target callsign is misspelt. The list of recently heard stations is scrollable (assuming there are enough stations). If you double-click on one of the callsigns, it will appear in the TX pane so you can use it as a message direction. Once a callsign has been highlighted, pressing Function Key F1 will also place the call in the TX pane. The general allcall direction appears in the list by default, for your operating convenience. Once a callsign has been highlighted, right-clicking the callsign opens a shortcut menu. This allows common queries and message send and retrieval commands to be executed without typing in the TX pane. Operation will not be described in great detail. Most of what is required is covered by non-Selcall operation, or is described in the Syntax and Rules. Once you've learned the simple syntax, it really is a simple and effective protocol to use. Apart from typing a target or direction address (callsign) and adding the trigger character, operation is really no different to normal FSQ mode. Examples are given in the Introducing FSQCALL section above. OFF Normal FSQ screen appearance and operation. No SELCAL button visible. No callsign verification or logging. SLEEP FSQCALL screen appearance (with option panes), but operation is as FSQ. No response to remote commands except *. No callsign verification or logging. SELCAL button is dark blue. ACTIVE FSQCALL screen appearance (with option panes), full FSQCALL operation, with callsign verification and logging. SELCAL button is light blue, turns green when Selcall opens. zl1ee How are you this evening? sends a simple sentence only to the same specific station. Other stations see nothing on their RX panes in either case. One slight difference in FSQCALL mode, that users won't even notice, is that the callsign that prefaces each incoming sentence in the main receive pane is a recovered and verified callsign. Unlike normal FSQ mode, it is recovered from the preamble and verified against the checksum before display. The reception is also logged, with time stamp and signal quality. There are four special buttons under the Option Panes, which can be pressed and light up at various times. This button is invisible when FSQCALL is OFF. It is dark blue when FSQCALL is in SLEEP. It is light blue when FSQCALL is ACTIVE (on and running). If FSQCALL appears to be on (the Option Panes and extra buttons show), but this button is not lit, normal FSQ operation happens, all incoming text is displayed and no automatic functions take place. FSQCALL is effectively in SLEEP. To turn FSQCALL on and ACTIVE, click this button so that it lights. If the button isn't visible, FSQCALL is OFF, so turn FSQCALL ON from the menu. When a valid FSQCALL sentence is sensed, this button glows green, and reverts to light blue when the squelch closes. If the sentence is addressed to you, it will then print. Sends the standard CQ message. Anyone in range with CQ reception enabled will see this message. The button is normally dark blue, and is light blue when active. After you've pressed this button, the program will transmit a standard sounding message (normally just the preamble), and again every 30 minutes (default) from the time the button was pressed. If you leave text in the TX pane, this will be added to only the next queued message. The button is normally dark blue, and is light blue when active. The periodic soundings are very short (three seconds at default speed), and do not appear on other station's screens, only in the Heard list and log. The purpose of this message is to allow other stations to build a Heard List. The message has the lowest priority. Note that when the SOUND function is on, your normal transmitted sentence text is not shown in the upper RX pane (normally red text). Not only are the soundings suppressed here, but normal transmission text is as well. It is best to turn SOUND off when you are in QSO. It's not needed then anyway, as Heard Lists and Logs work equally well from QSO sentences. When an incoming message is automatically saved to file (# command), this button, normally dark blue, lights red. When you press it, the message file opens, an acknowledgement is sent, and the light goes out. You can press the button at any time to read the most recent file (press it twice). Pressing Function Key F1 will place the currently highlighted callsign in the Monitor Heard List into the TX pane, so it can be used as a direction. Pressing Function Key F2 will place the last sentence sent into the TX pane so it can be repeated. The Heard Log (Menu/File/Open Heard station log) lists every verified transmission (any transmission where the callsign has been verified against the checksum) heard by your station. You can open this list and search it to see when a station of interest was last heard. The log can be quite long, and includes all soundings and other transmissions by other stations, in chronological order, with date, time and signal report (SNR). It's probably a good idea to clear the file on a daily basis by choosing File/Archive Heard station log from the menu. The program will archive the old file and start a new one. The file is in CSV format (comma separated values), so if you change the file suffix to .csv, it can be analysed using a spreadsheet. Dir (direction, in or out), Date, Time, From (origin callsign), SNR/Speed, Trigger, Message (quoted message content, truncated if longer than 250 bytes). Log files in CVS format have extension .csv and can be analysed using a spreadsheet. Common log format files have extension .log and are more human readable but can be easily processed by scripts. These logs can be quite long too. It's probably a good idea to clear the file on a daily basis by choosing FSQCALL/Archive Traffic Log from the menu. The program will archive the old file and start a new one. Data in the Monitor tab and RX File Tab is lost when you switch FSQCALL on and off. There are two solutions to this: (a) save the contents to a text file using copy and paste; or (b) instead of turning FSQCALL off (say to chat in FSQ mode), press the SELCAL button (which puts FSQCALL to sleep). This will revert to FSQ mode but leave the tabs and their content in place. The Heard Log is not affected in either case. The Heard log Heardlog.txt and Traffic logs only accumulate entries in FSQCALL mode. It is only in this mode that the program can verify callsigns. It continues to log in SLEEP mode. You can manually edit the QTH and QTC messages by editing the FSQCALvnnn_setup.txt file, but you must do so with the program closed at the time. You can also edit the CAT baud rate and COM port in the FSQCALvnnn_setup.txt file, but not the radio address, since it is selected only by an index. If your radio isn't in the list, read the setup information above carefully and set the commands manually. FSQCALL only uses TX and RX CAT commands. To sent text from a file, you must first type the file direction and trigger (e.g. zl1xyz#). When you then open the file using File/File to send, the file name to save to will be appended automatically (e.g. zl1xyz#[test.txt]) into the TX pane, followed by the file data. Then press Enter or click on TX to transmit. Shortcut: To send a text file to a station in the heard list, left-click to select the call and then right-click to open the shortcut menu. Choose Send File To... (#) to launch an 'Open File' dialog. Browse for the desired file and click Open to send the file automatically without the need to type in the TX pane. Only text files may be sent. No error correction is used. You can store manually typed text to a file at another station using the same command, but with a manually typed file name and manually typed text, (e.g. zl1xyz#). If you wish to send from file, but change the file name, proceed as above, but edit the filename in the TX buffer before you press Enter. Requesting station A to ask for a report from station B (using !) will not be useful if station B can hear you make the request. You'll get two replies - either one after the other if station A and station B can hear each other, or both at once if they can't. Using the ~ (delayed relay) command may help, as it will allow one station to reply before the other. If a station you want to send a message to doesn't respond, (but you are sure it is there), it may be in SLEEP. You can force it into ACTIVE mode by sending the ACTIVE command (callsign*). It will respond with (origin_call Active) when it switches to ACTIVE, also if it is already ACTIVE. If FSQCALL is OFF at the station, you cannot remotely wake it up and there will be no response. While there is type-ahead text in the TX pane, your station will not respond to remote commands. This is so in order to prevent responses to commands from 'stealing' your text, i.e. transmitting it before you are ready! When in conversation, you are encouraged to type ahead. This speeds up the QSO and improves channel utilization. The Alert BEEP may not be heard on all computers. If you have only one sound card, it will (like the FSQ transmissions) be directed to the radio. With two or more sound channels, you should direct system sounds to another sound channel which has a speaker, and you'll hear the BEEP - it might frighten the @#$%^&*! out of you when it goes off, if it's too loud, so check your system sound volume! The FSQCALL software may not run well on a low-spec or 'netbook' type computer, as the processing power required, especially for reception, is rather high. On a modern dual core computer the processor load should be only about 1%. Check the Task Manager, and make sure no other tasks are running. You can remotely change a station's operating speed up or down, using the 'callsign<' (slower) and 'callsign>' (faster) commands. The station will reply at the new speed, and tell you what speed it is now running. If it is at the maximum or minimum speed already, it will reply with 'OK'. Automatic Link Establishment. A type of radio protocol which allows radio stations to connect to each other automatically. These systems can be very sophisticated and operate by scanning multiple radio channels and building sophisticated and dynamic tables of where best to contact each station. There are several proprietary ALE systems, such as MIL STD 188-141A, FED-STD-1045, CODAN's CALM and CCIR 493, which may or may not be interoperable. All require expensive modems, or radios with built-in modems, with the exception of PC-ALE, which operates MIL STD 188-141A and MIL STD 188-110 on a PC. They are generally very complex and require scanning radios, broadband antennas, and expert users. A special message which causes a prominent warning message to appear on another station's computer screen, and may sound a BEEP. When the station responds by closing the message, an acknowledgement is transmitted to the originator. Cyclic Redundancy Check. This is a mathematical algorithm used to both generate a special number (called the CRC) from some information, and to check the number against the information it protects. The 8-bit algorithm used here can detect up to four errors in a 20-character callsign preamble. It cannot do any error correction, however. Carrier Sensed Multiple Access. A network management protocol which allows multiple stations to use a single radio channel automatically. Stations cannot transmit if they sense that another station is active, and various delays are added once the channel is free, according to the message priority, to ensure reliable access with minimum collisions (doubling). CSMA works best where all stations can hear each other; otherwise collisions can (and do) occur. The address(es) or callsign(s) used to direct which stations an FSQCALL sentence goes to. It will print at the addressed stations, but nowhere else. Fast Simple QSO mode. The underlying MFSK transport modem used by FSQCALL. The special Selective Calling and Link Management protocol which has been added onto the FSQ mode in this program. The process of sending a query message callsign? to another station. If active and within range, the station will automatically reply with a directed message containing a signal report. The report is of SNR (signal to noise ratio). FSQ will copy easily down to -10 dB SNR. Polling is like sending 'hw?' in Morse. The 'stuff' that is added automatically at the start of an FSQ or FSQCALL transmission sentence is termed the preamble. In FSQ it simply consists of callsign:, while in FSQCALL mode it has an added checksum, callsign:cs, where 'cs' is two numbers and/or letters representing a checksum error check of the callsign. In the context of FSQ and FSQCall, the sentence forms the basis of all radio transmissions. Normally, a sentence is something you type in the TX pane, and when you're done, you press ENTER and the sentence is transmitted. However, the sentence may contain more than one literal 'sentence'. In fact it can also contain a whole file transmission. However, the defining thing about the sentence is that it has a specified preamble and a defined ending sequence; and sentence transmission starts when you press ENTER. 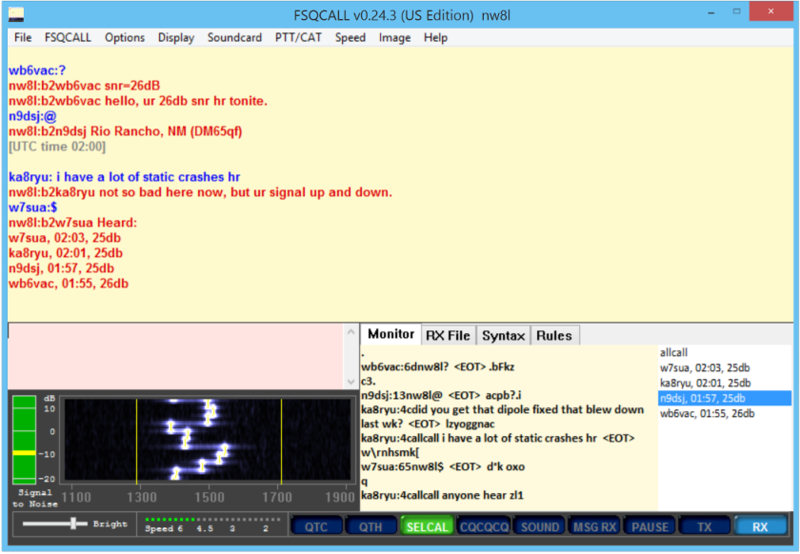 A special transmission in FSQCALL mode which sends just the station preamble. This takes about two seconds, and although it does not print at any stations, all the station logs and 'Heard' lists are updated. This makes determining if a certain station is active, and in range, very easy. You can initiate a sounding manually (press ENTER), or set a timer which generates them periodically. A system which prevents unwanted noise when there is no station operating on a radio channel. In the FSQ context, this means no printed 'junk' on the screen between stations. The squelch operates by detecting the signal-to-noise ratio of valid signals, and comparing this with a preset threshold. In FSQ the squelch is also used to lock out inadvertent transmissions. In FSQCALL, the squelch is also used by the CSMA channel management system. The Smart Squelch used by FSQCALL enables it to use a slow-closing squelch time-constant designed to prevent premature closing of the squelch during a fade, yet because of a special end-of-transmission sequence, can be closed quickly to prevent 'junk' when the transmission ceases normally. A special one-character command which immediately follows a direction (callsign) in a sentence. There are a number of these special 'trigger' characters, ? * ! ; # % + @ & $ < and > plus space being most commonly used. The program lists the correct syntax for all current commands in the Syntax Option Pane Tab. The Windows™ software is written in ANSI C, and is compatible with Vista, WinXP, Win7 and Win8. The program requires at least a 2GHz dual core processor, SVGA display and a 16-bit sound card. A Pentium 2 class or better is suggested. One serial port (or USB equivalent) is required for PTT control. Memory requirements are minimal, and the program size is about 350kB. The program window size is small, and fixed, allowing you to use a laptop with a modest screen, or allowing room for other applications on the screen. The program consists of just one file, and no changes are made to the computer's registry or anywhere else. To remove the program, simply delete the files made during installation. A setup file is made in the working folder. This can be deleted in order to start afresh. CAT functions have had limited testing due to lack of suitable rigs. CAT is known to work with Icom, and some Kenwood and Yaesu rigs, but we could do with assistance testing other transceivers. Developers interested in writing software for FSQ and/or FSQCAL should contact ZL2AFP (zl2afp "at" xtra.co.nz) for source code and other details. Copyright © Murray Greenman and Con Wassilieff 2013-2015. All rights reserved.